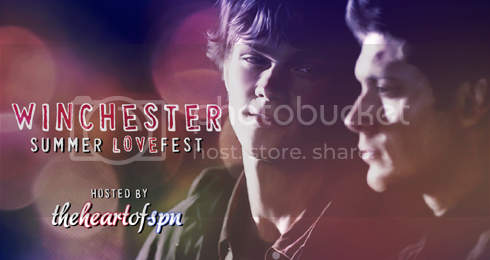 Signup for theheartofspn's Winchester Summer LOVEfest!, a two-month, multi-media celebration of the Winchester brothers leading up to the Season Eight premiere. Any fan who wants to participate can sign up now through the end of July, and celebrate their love of the brothers in any way they choose: fic, vids, art, picspam, meta, graphics, recs – if you created it and it’s about the Winchesters, we want to see it! I think this is a lovely idea, and am planning to participate. Go check it out, maybe you'll want to add something into the mix. By the way, it's a great new community, lots of eyecandy and thought-provoking meta all based around the Sam and Dean relationship. I signed up to write a fic about the future, and my idea is "Sam and Dean re-negotiate everything when Dean gets back from Purgatory." We'll see how it turns out, based on all the recent spoilers, probably pretty angsty, but knowing me there'll be plenty of schmoop thrown in there also. And oh god marciaelena has done it again, look at that absolutely gorgeous banner. Ooh, so much potential in your concept. I don't read spoilers, but certainly the boys are going to have a lot to think about during their time apart and you can never go wrong with an angst schmoop combo. Hah! I'm on a roll...Glad you'll be posting some wee!chesters, I love that stuff. And your first one, very cool! Oh no, you don't read spoilers, I hope I didn't spoil you with my little summary there, I'll make sure to put warnings on my story, thanks for the reminder! And yeah, angst/schmoop is my fave to write, but I can definitely go wrong sometimes getting even too schmoopy for myself. But with a separation/reunion story, there's lots of angst built it already. Oh, no, not at all. I'm not the sort who is vehemently against spoilers. If someone mentions one I'm fine - I just don't actively seek them out and tend to avoid spoiler posts. I just like seeing it as it happens. Ha! Schmoopy overload. I can honestly say I've never had that happen in my writing ;) Like you said, your scenario already has plenty of angst and the boys deserve a little schmoop to balance it out especially since they won't be getting it from me.